Friday the 27th January 2012 was a very special Red Sock friday for Hannah Marshall. The Urban Sky Trust and Red Sock Friday campaign handed over a cheque for R20 000-00 to Hannah Marshall towards her cochlear implant. She is expected to have the first operation done on the 26th March 2012. The family will leave for Cape Town a week earlier as Hannah still has a few tests to undergo before the procedure. The socn cochlear implant will be done at a later stage. We will still continue to raise funds for Hannah's second operations so keep spreading the word every Frida is Red Sock Friday. Thank you to everyone who supported the Urban Sky Trust and the Red Sock Campaign where we can proudly say...today we have made a difference! Hannah Marshall was born in November 2010 with a severe hearing loss in both ears and suffers from the eye condition Nystagmus. She requires a cochlear implant in both ears. 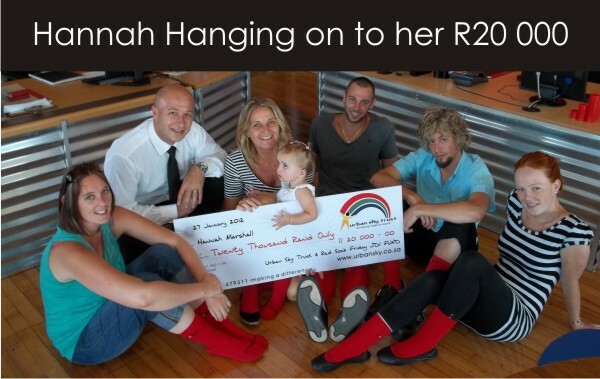 The Urban Sky Trust "adopted" Hannah Marshall late 2011 and through our Red Sock initiative we raise funds to assist Hannah with the medical expenses towards the cochlear implants that the medical aid does not cover. The I Wear Red Socks on Fridays is the campaign we are driving to raise these funds. The initiative involves hopping into Red Socks on Fridays and making YOUR difference in the world. RED SOCK apparell can be purchased direct from our offices at 1 Stanley Street Richmond Hill Port Elizabeth for R40-00 per pair. We challenge you to hop into your RED Socks and ROCK! Contact us 041 582 1199 for more information on how you can get involved.